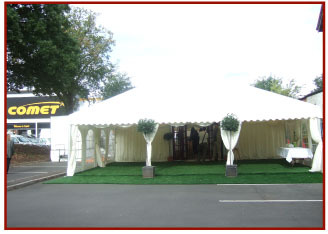 Whether you’re planning a family wedding, a party for family and friends, or an important corporate entertainment event there’s something special about a marquee. 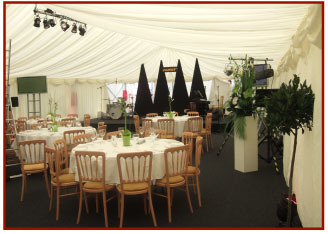 A marquee creates a unique atmosphere – adding a touch of class to an event, but at the same time helping to create a relaxed environment. 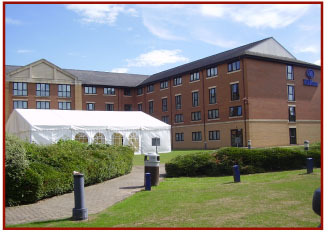 In the case of family weddings or parties, the real benefit of a marquee is that you can enjoy the day in your own surroundings, your own home and grounds. . . But, of course, it is vital that the planning and attention to detail that goes into the occasion is meticulous, and that everything used is the highest quality. 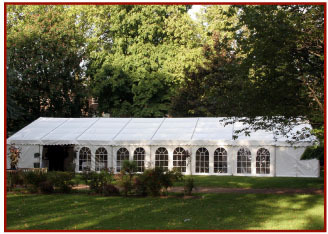 And if you asked Crest Marquees Ltd to undertake the occasion for you, you can be certain that your wedding or party will be remembered by all. There’s no finer way to enjoy one of you family’s really big days than with a marquee at your home. 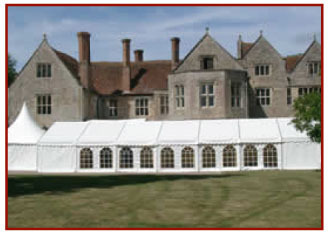 Crest Marquees Ltd likes to become involved as early as possible with the planning of a wedding. The size of marquee required, setting of the marquee to best show off features within the grounds, details such as the inclusion of entrance porches, windows, lighting, a dance floor – all are best discussed at an early stage. 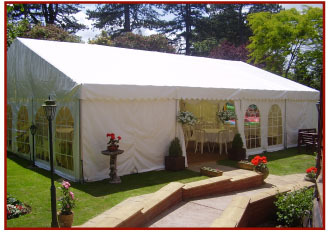 Whether it’s a garden party on a summer’s afternoon, a 21st Birthday party for a son or daughters, or a New Years celebration, Crest Marquees Ltd can provide a setting to match the mood of the occasion and ensure the comfort of your guests. Whatever the time of year, spectacular landscape lighting can be used to enhance interesting views, and highlight garden features – adding another dimension to your event. Crest Marquees Ltd can arrange creative lighting for you to bring a touch of magic to your venue. Marquee hire can be themed to match the event, dance floors can be built in, and floral decoration can be used to maximise the visual impact. All we need to know from you is what you want to achieve – and we will do the rest. Whether you are entertaining clients at a county or trade show, at an event at your company premises, or at a sporting event, you will want your guests to get the most from your event. Crest Marquees Ltd will ensure this happens. Our attention to detail and personal service will create the right environment for you to impress your clients. Acocks Green, Alcester, Alum Rock, Alvechurch,Aston, Aston Cantlow, Astwood Bank, Baddesley Clinton, Balsall Common, Balsall Heath, Barnt Green, Barston, Bartley Green, Bearley, Beaudesert, Beausale, Bentley Heath, Beoley, Berkswell, Bickenhill, Bidford upon Avon, Billesley, Blackwell, Bordesley, Bordesley Green, Bournville, Brierley Hill, Bromsgrove, Broom, Bushwood, Camp Hill, Cannon Hill, Castle Bromwich, Cheswick Green, Clent, Cofton Hackett, Cookhill, Cotteridge, Coughton, Coventry, Danzy Green, Dickens Heath, Digbeth, Dodford, Dorridge, Drayton, Droitwich Spa, Druids Heath, Dudley, Earlswood, Edgbaston, Feckenham, Frankley, Great Alne, Greet, Hagley, Halesowen, Hall Green, Hanbury, Handsworth, Handsworth Wood, Harborne, Hartlebury, Haseley, Hatton, Hawkesley, Hay Mills, Henley in Arden, Highters Heath, Hockley, Hockley Heath, Hollywood, Inkberrow, Kenilworth, Kidderminster, Kings Coughton, Kings Heath, Kings Norton, Kingswood, Knowle, Ladywood, Langley, Lapworth, Lichfield, Lickey, Longbridge, Lozells, Majors Green, Mappleborough, Maypole, Meriden, Monkspath, Morton Bagot, Moseley, Nechells, Northfield, Oldberrow, Olton, Pershore, Portway, Quinton, Redditch, Rednal, Rotton Park, Rowington, Royal Leamington Spa, Saltley, Sambourne, Sandwell, Selly Oak, Selly Park, Sheldon, Shirley, Shrewley, Small Heath, Snitterfield, Soho, Solihull, Sparkbrook, Sparkhill, Spernall, Staffordshire, Stechford, Stirchley, Stoke Prior, Stourbridge, Stratford Upon Avon, Streetly, Studley, Sutton Coldfield, Tanworth in Arden, Temple Grafton, Tidbury Green, Tutnal, Tyseley, Ullenhall, Walkers Heath, Walsall, Warstock, Warwick, Warwickshire, Washwood Heath, Water Orton, Welford Upon Avon, Weoley Castle, West Bromwich, West Heath, West Midlands, Wilmcote, Winson Green, Wixford, Wolverton, Wombourne, Wood End, Woodgate, Wootton Wawen, Worcestershire, Wroxall, Wythall, Yardley, Yardley Wood.